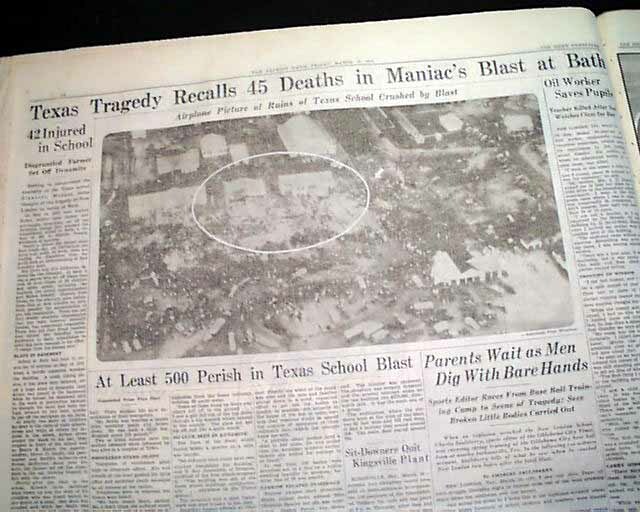 This 32 page newspaper a nice banner headline on the front page: "500 Bodies Recovered in School Blast; Sorrowful Search Pursued in Ruins of Shattered School in Texas, With Many of the Workers Seeking Their own Children " with large photo and subheads/ Many more related photos inside with 2 full page pictorials (see images). Other news, sports, advertisements of the day throughout. Rag edition in very nice condition. 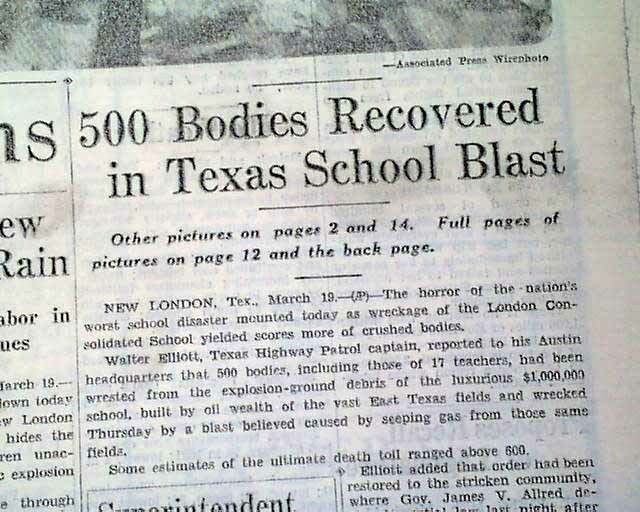 wikipedia notes: The New London School explosion occurred on March 18, 1937, when a natural gas leak caused an explosion, destroying the New London School of the city of New London, Texas. 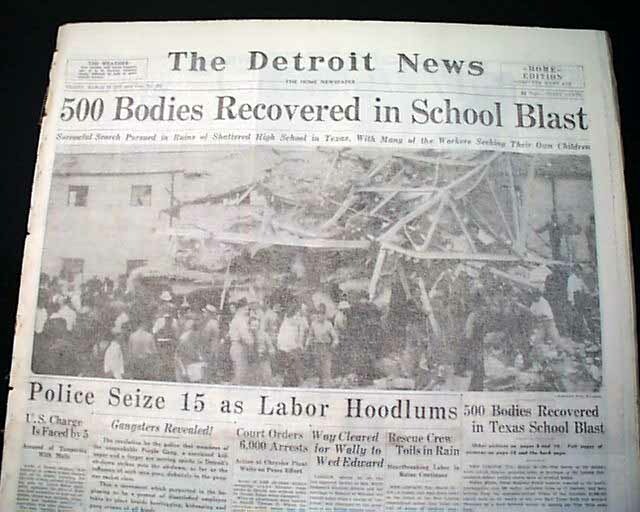 The disaster killed in excess of 295 students and teachers, making it the worst catastrophe to take place in a U.S. school building. 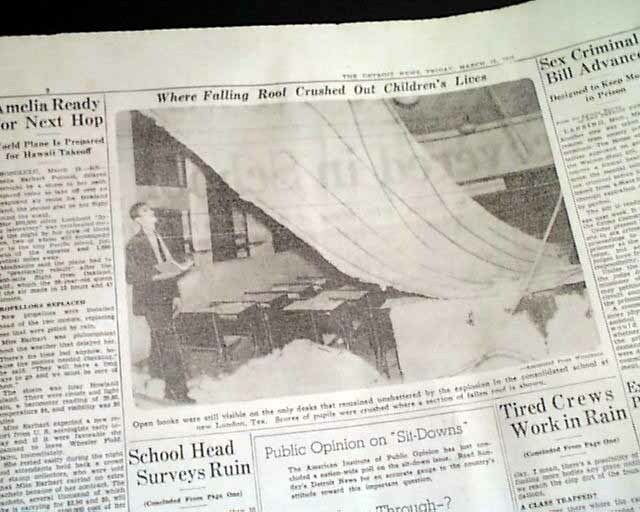 The school was built on sloping ground, and a large dead-air space was contained beneath the structure. The school board had overridden the original architect's plans for a boiler and steam distribution system, instead opting to install 72 gas heaters throughout the building. 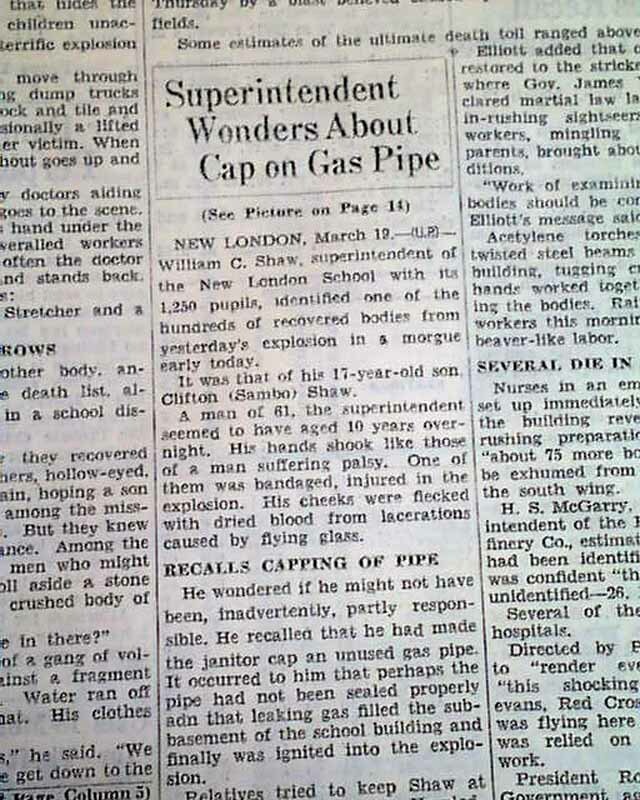 Early in 1937, the school board canceled their natural gas contract and had plumbers install a tap into Parade Gasoline Company's residue gas line in order to save money. 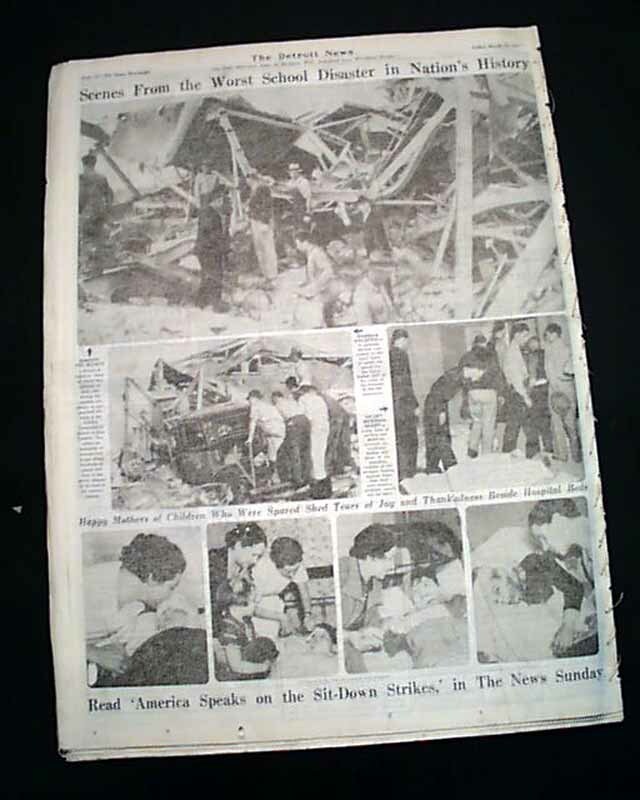 This practice, while not explicitly authorized by local oil companies, was widespread in the area. The natural gas extracted with the oil was seen as a waste product and was flared off. As there was no value to the natural gas, the oil companies turned a blind eye. This "raw" or "wet" gas varied in quality from day to day, even from hour to hour. Natural gas in its natural state is both odorless and colorless, and therefore any leaks would be undetectable. Gas had been leaking from the residue line tap, and had unknowingly built up inside an enclosed crawlspace that ran the entire 253-foot length of the building's facade. Students had been complaining of headaches for some time, but little attention had been paid to it . Friday's classes had been canceled to allow for students to participate in the neighboring city of Henderson's Interscholastic Meet, a scholastic and athletic competition. 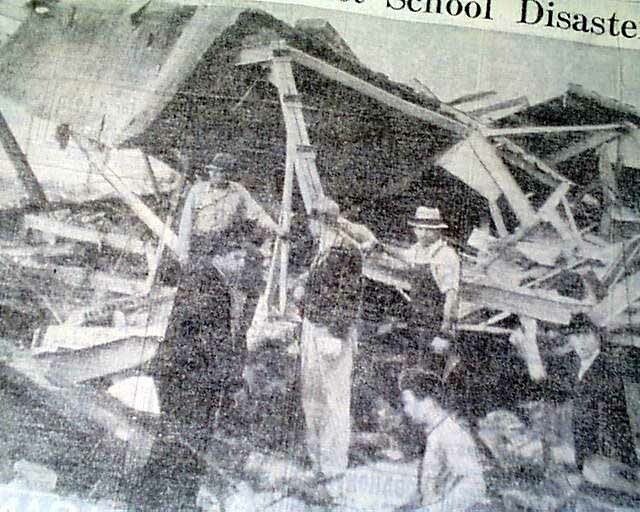 As per the school's normal schedule, first through fourth grade students had been let out early. 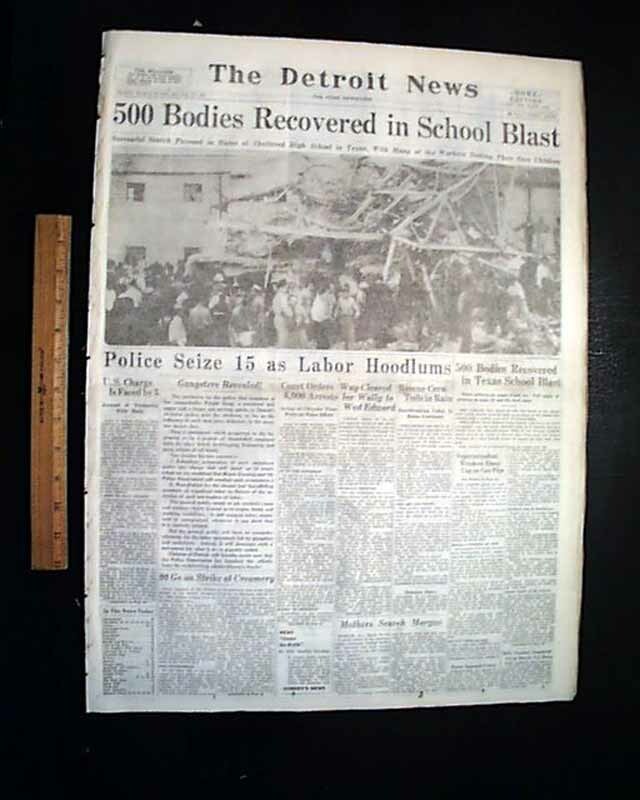 A PTA meeting was being held in the gymnasium, a separate structure roughly 100 feet from the main building. 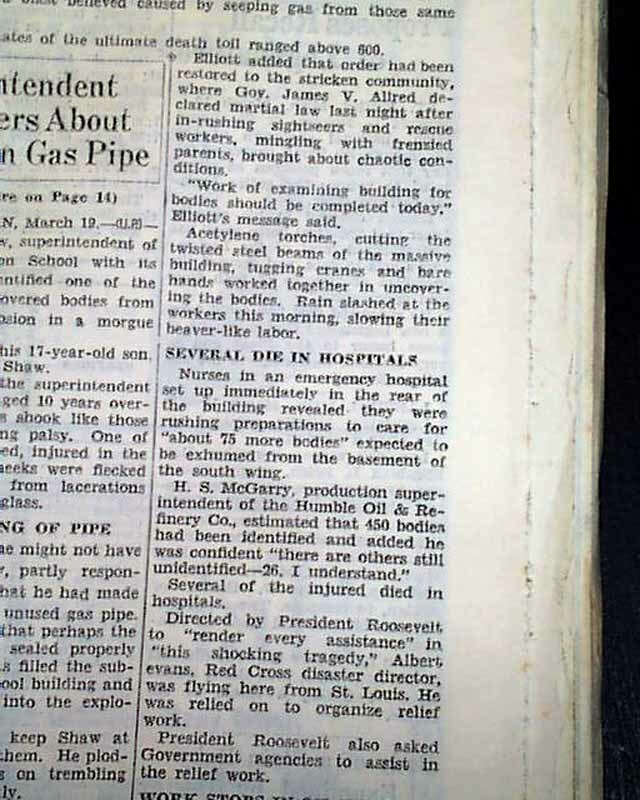 At some time between 3:05 and 3:20PM Central (local) time, Lemmie R. Butler (an "instructor of manual training") turned on an electric sander. It is believed that the sander's switch caused a spark that ignited the gas-air mixture. 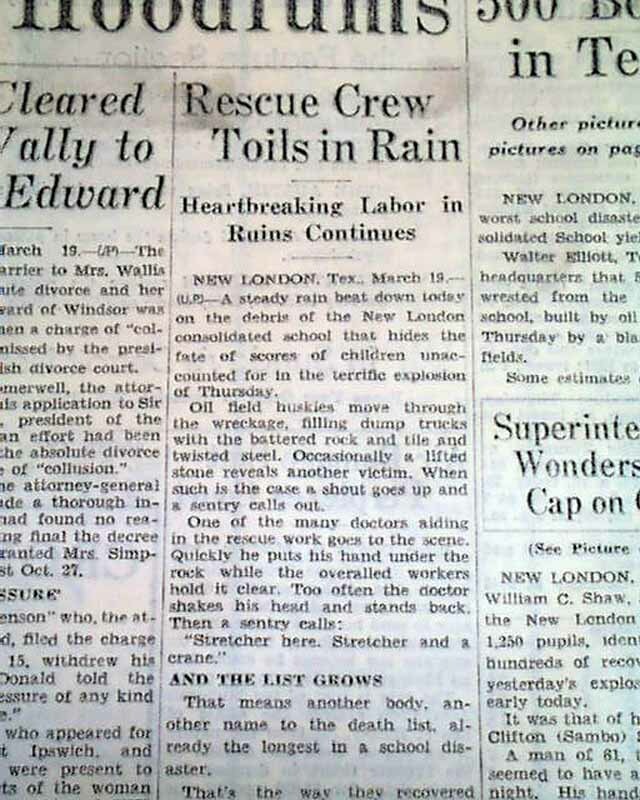 Estimates of the number dead vary from 296 to 319, but that number could be much higher, as many of the residents of New London at the time were transient oilfield workers, and there is no way to determine for certain how many of these roughnecks collected the bodies of their children in the days following the disaster, and returned them to their respective homes for burial. 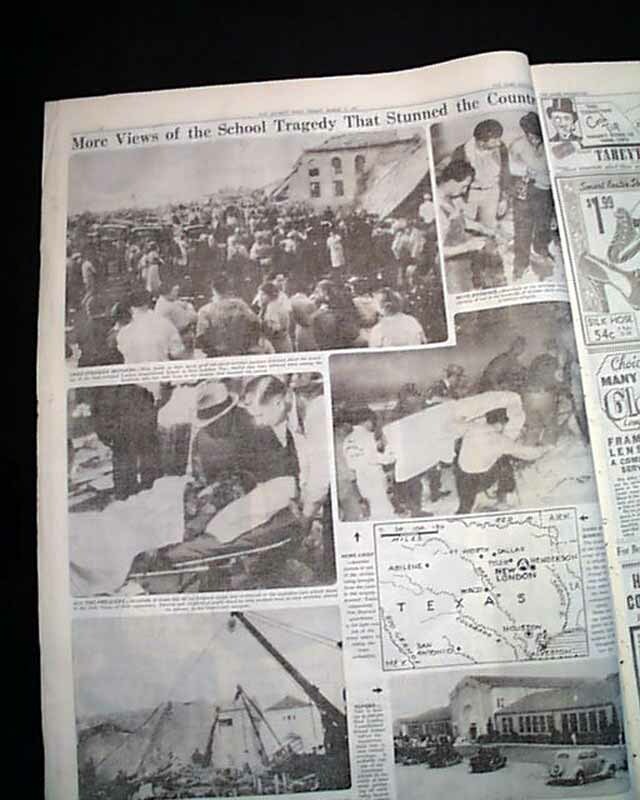 Approximately 600 students and 40 teachers were in the building at the time; only about 130 escaped without serious injury.